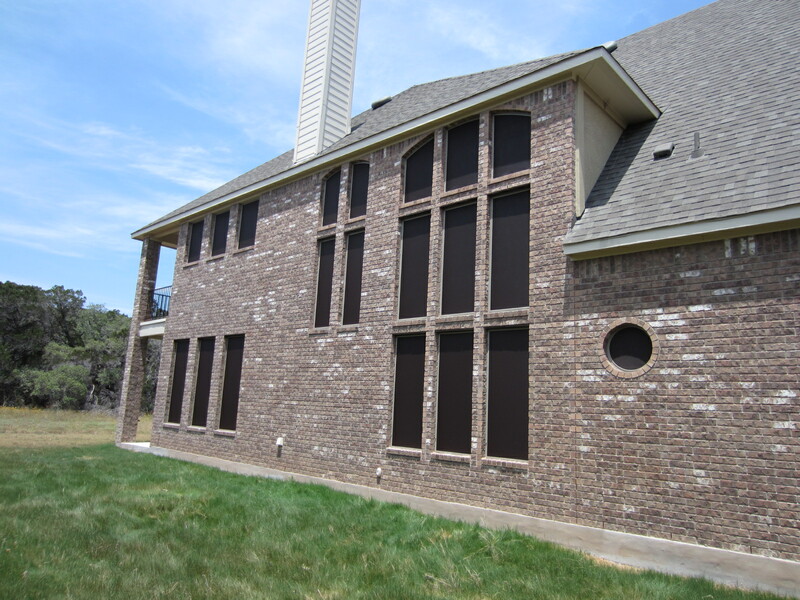 This is a solar screen installation we did on a brand‑new home in Dripping Springs, Texas. We used the chocolate fabric with champagne frame. We just put solar screens on this side of the home, the left side of the home, and we put some on the back of the home. There are a lot of arched windows on this home, and as you can see by this picture, there is a circle window. For odd shaped windows outside of the arches, like circles, like hexagons, like raked windows, please go to our pricing page where you will see a specific price sheet just for those windows. Because this side of the home faces due west, it is this side that we’ve put the 90 percent solar screen fabric. This entry was posted in Our Solar Screen installation examples on December 30, 2013 by admin.